Last major update issued on December 1, 2003 at 04:45 UTC. The geomagnetic field was quiet to unsettled on November 30. Solar wind speed ranged between 365 and 544 km/sec. A very weak moderately high speed coronal stream was observed early in the day. After 09h UTC ACE data did not any longer indicate the presence of that stream and a weak disturbance (unidentified source) dominated the solar wind for the remainder of the day. Solar flux measured at 20h UTC on 2.8 GHz was 152.8. The planetary A index was 10 (STAR Ap - based on the mean of three hour interval ap indices: 11.3). Three hour interval K indices: 22223332 (planetary), 22213332 (Boulder). At midnight there were 10 spotted regions on the visible disk. Solar flare activity was low. A total of 4 C class events were recorded during the day. Region 10507 decayed slowly and is rotating over the northwest limb. Region 10508 decayed very quickly and lost about three quarters of the penumbral area. The region will rotate over the southwest limb tomorrow. Flares: C1.1 at 03:00, C1.2 at 10:11 and C2.1 at 15:31 UTC. Region 10510 decayed quietly and lost penumbra on all spots. Rudimentary penumbra is still visible on quite a few of the many small spots. Region 10511 decayed slowly and quietly. Region 10515 decayed and could become spotless today. Region 10516 developed slowly and quietly. New region 10517 rotated into view at the southeast limb. This is currently the most interesting region on the visible disk. Further C class flaring is likely, a minor M class flare is possible. Flares: C4.6 at 000:11 UTC. [S318] A new region emerged just southeast of region 10516 on November 30. Location at midnight: S22E47. 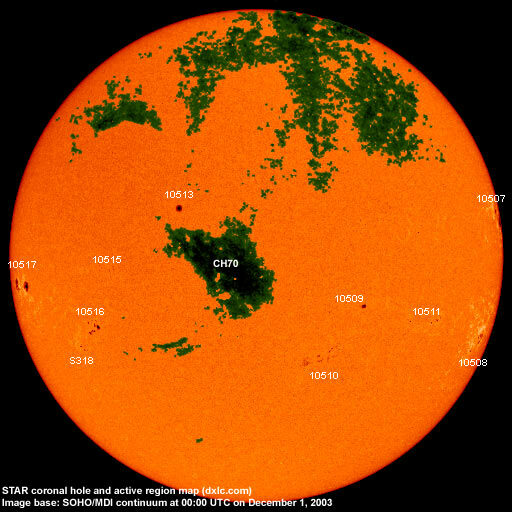 November 28-30: No partly or fully earth directed CMEs observed. A recurrent trans equatorial coronal hole (CH70) was in a geoeffective position on November 30 and December 1. Processed SOHO/EIT 284 image at 19:05 UTC on November 30. The darkest areas on the solar disk are likely coronal holes. 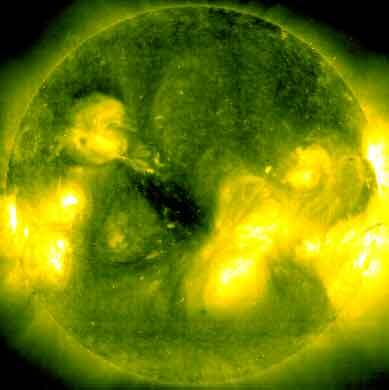 The geomagnetic field is expected to be quiet to unsettled on December 1-2. 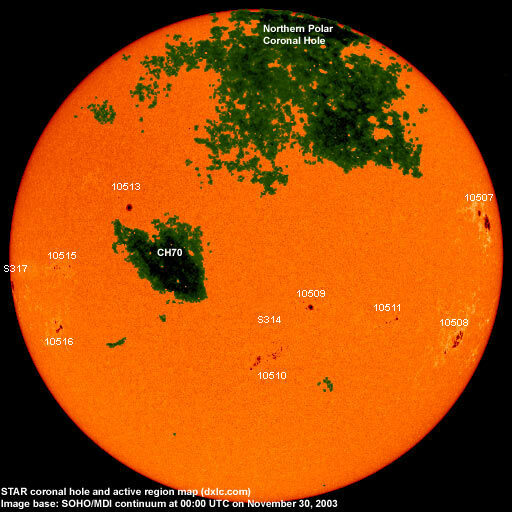 On December 3-4 unsettled to major storm conditions are likely due to a high speed stream from coronal hole CH70. Long distance low frequency (below 2 MHz) propagation along east-west paths over high and upper middle latitudes is very poor. Propagation along long distance north-south paths is poor. [Trans Atlantic propagation conditions are currently monitored every night on 1470 kHz. Dominant station tonight: Radio Cristal del Uruguay with CPN Radio (Peru) noted at times].